Colombia's largest rebel group, the Farc, has released two hostages held captive since 25 January. The policemen were handed over to an International Committee of the Red Cross mission, and a captive soldier was expected to be freed on Saturday. In a separate development it emerged shortly after that five of six mine workers held by the second biggest rebel group, ELN, had also been freed. The six were captured in a raid on a mining company on 18 January. The Farc operation was originally scheduled for Thursday, but the left-wing rebels delayed it, reportedly complaining of too many reporters in the area. However, Friday's release was broadcast live by Venezuelan TV station Telesur. Officers Cristian Yate and Victor Alfonso Gonzalez were freed in the Valle del Cauca department, apparently in good health. They were taken to the regional capital Cali, and were to be later flown to Bogota. The rebels and the government have been holding peace talks in Cuba to try to end their almost five-decade-old conflict, but tensions have been rising since the Farc ended a unilateral ceasefire last month. The release of the policemen is likely to be interpreted as a goodwill gesture from the rebels. Farc's decision to quickly free the captives suggests the rebels are no longer willing to pay the political price for capturing and holding members of the Colombian security forces for too long, says the BBC's correspondent in Bogota, Arturo Wallace. Last year, the rebels pledged to stop kidnapping for ransom and released 10 policemen and soldiers they had been holding captive. In January, however, they said that capturing police and military officers was "part of its right" when they "surrender in battle". The five mine workers released by the leftist ELN (National Liberation Army) were also seized in January, in a dawn attack on a mining company in Bolivar province in northern Colombia. The operation involved a reported 20 rebels. 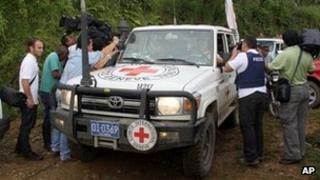 The International Committee of the Red Cross said in a statement that three Colombians and two Peruvians, who were working for Geo Explorer, were freed. But there was no mention of the sixth captive, a Canadian. The ELN had earlier said all six men were to be released. On Wednesday, at least seven Colombian soldiers were killed and another five injured in clashes with the Farc in Caqueta in another escalation of the violence since the end of the unilateral cease fire. The Colombian government says it will only end its operations against the Farc once a peace agreement has been signed.